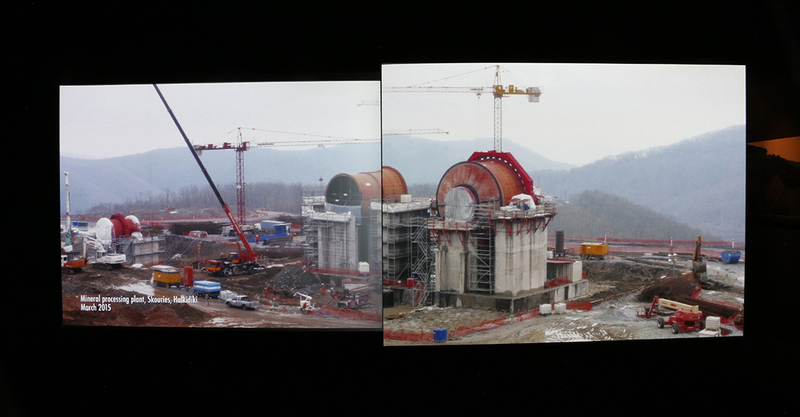 Unearthing Disaster I & II, a video installation by Berlin- based artists, Angela Melitopoulos and Angela Anderson, is the result of years of research on the destruction of a pristine, mountainous forest region in Northeastern Greece by Eldorado Gold, a Canadian mining company. Since 2013, Melitopolous and Anderson have documented the environmental, social, economic, and psychological damage inflicted on this region by El Dorado's construction of a massive open pit gold mine. Unearthing Disaster II & II is presented in conjunction with EXTRACTION, a conference May 12-13 at UC Santa Cruz, organized by T.J. Demos of the Center for Creative Ecologies and A. Laurie Palmer. 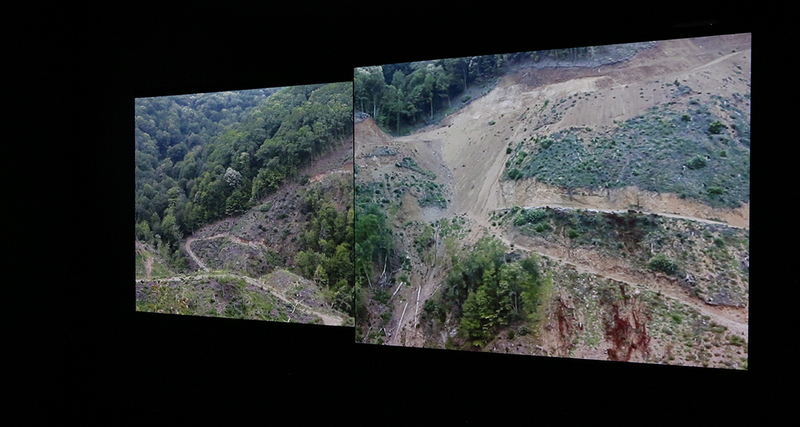 The two-channel video installations Unearthing Disaster I & II, produced respectively in 2013 and 2015, are shown on opposite sides of the same projection screens. Together, they capture the pulverisation of the natural and cultural environment in the Skouries forest of the Halkidiki region, as well as the intense outpouring of citizen dissent that erupted in response. Unearthing Disaster I accompanies local activists on a journey through their once-familiar landscape, made unrecognizable in a matter of days by the forces of industrial capitalist resource extraction. Through the course of this journey, the scale of an imminent ecological disaster unfolds through stories about millions of trees cut, clean water disappearing from the mountain, and the sell-out of the region by local politicians. The artists show violent police and private security clashes with protestors gathering to oppose the mine and preserve the natural environment and their own livelihoods. They also document encounters with workers who vehemently defend the mining project. Unearthing Disaster II offers a poetic and moving overview of the stakes in this struggle. It contrasts the molecular, intelligent, rhizomatic networks of plants, trees, streams, and earth with the massive, violent, mechanized destruction of these networks in the name of profit and “development.” In scene after scene, the artists chart a relentless onslaught on the idyllic Greek landscape, already transformed into an unrecognizable and barren mountaintop desert. The struggle shown in Unearthing Disaster I & II is ongoing. In 2015 a newly elected Greek government vowed to stop the construction of the mine, but the economic situation in Greece and the demands of global creditors blocked its promise. Against this backdrop, Melitopolous and Anderson's work calls implicitly for a re-evaluation of entangled economic, social and political systems which drive massive ecological and cultural destruction in the name of profit. The protest movements they powerfully portray assert that our future survival is bound to a global political struggle for ecology that recognizes the interconnectedness of environmental, political, social, cultural, economic, and ethical values. Since 1985, Angela Melitopoulos has produced experimental video-essays, installations, documentaries and sound pieces. Her work focuses on mnemopolitics, time, geography and collective memory in relation to electronic/digital media and documentation. Melitopoulos explores and invents new forms and formats for her art practice, and works also on collaborative geopolitical projects, organizes international seminars and creates activist media projects. Her installation ‘Assemblages’, co-realized with the philosopher Maurizio Lazzarato, initiated a series of debates around Félix Guattari’s notions of the role of machnic animism in our subjectivity. Since 2013, her collaboration with Angela Anderson has produced two video-installations and a radio project. Melitopoulos studied Fine Arts at the Art Academy in Duesseldorf with Nam June Paik, and she holds a Ph.D. in Visual Cultures at Goldsmiths University in London. She is teaching as a professor in the Media School of the Royal Art Academy of Fines Arts in Copenhagen. Melitopoulos' videos and installations have been awarded and exhibited in many international festivals, exhibitions and museums. Currently she is undertaking a film project for dOCUMENTA14. Angela Anderson is an artist & filmmaker working at the intersection of the fields of philosophy, ecology, economics, migration, media and feminist & queer theory. She has worked with many artists and filmmakers on the realization of performative, filmic and installation projects. Since 2013 she has been working with Angela Melitopoulos and anti-mining activists in NE Greece on the audio-visual research project Unearthing Disaster. Recent exhibitions include Framer Framed – Amsterdam, the 2015 Thessaloniki Biennale and Holbaek Images (both with Angela Melitopoulos). She is the exhibition designer for Forum Expanded (Berlin International Film Festival) and holds an MA in Film and Media Studies from the New School, and is currently a PhD student at the Academy of Fine Arts in Vienna.